1. NOTICE IS HEREBY GIVEN pursuant to Section 87(2) of the Local Government Act 1972 that SUE NEARY and ANDREW TREMAYNE have ceased to be members of Wendron Parish Council and that two casual vacancies exist in the Wendron Ward. 2. 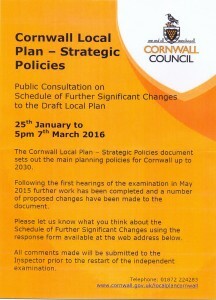 If, within 14 days (excluding Saturdays, Sundays, Christmas Eve, Christmas Day, Good Friday and Bank Holidays) after the date of this Notice, a request for an election to fill the said vacancies is made in writing to the Returning Officer of Cornwall Council at the Council Offices, St Austell One-Stop Shop, 39 Penwinnick Road, St Austell PL25 5DR (phone 01209 614195) by TEN (or more) electors for the said Ward an election will be held to fill the vacancies. 3. If the Returning Officer receives fewer than ten written requests for an election by 3rd October 2018 the Parish Council will fill the vacancies by co-option. Specifications and schedules are available by clicking on the above links as appropriate. You may be just the person your Parish needs! Four residents have put themselves forward for election to the Parish Council. This means that with effect from May 9, 2017 the Council will be inquorate and cannot lawfully make decisions. In an attempt to resolve this issue there will be an additional election on a date yet to be announced. To view the list of those members already elected, please click here. Many people take care of a loved one, neighbour or friend, often without looking upon themselves as Carers. The Cornwall Carers Service recognises the invaluable work carried out by Carers and offers support to them through a number of Carers’ Forums which are held within the county. The Forums give Carers a voice about the services they receive and any concerns or issues which they may have. All Carers are welcome at the Forums, so please do come along and, if you know someone who is a Carer, please tell them. Expenses can be paid to enable Carers to attend the Forum Meetings. At the Parish Council meeting this evening Sue Neary and Andrew Denton both of Porkellis were co-opted on to the Council. 1. NOTICE IS HEREBY GIVEN pursuant to Section 87(2) of the Local Government Act 1972 that SHARON HOOK and MARIE NUTE have ceased to be members of Wendron Parish Council and that two casual vacancies exist in the Wendron Ward. 3. If the Returning Officer receives fewer than ten written requests for an election by 6th November 2015 the Parish Council will fill the vacancies by co-option. The first steps towards publication of a Neighbourhood Plan are now being taken. This document will eventually sit alongside the Cornwall Local Plan as part of the development plan for our parish and will help in making decisions on most planning applications. If you are a resident of the parish and would like to become involved, please complete the questionnaire (click here) – and if you would like to become even more involved, please write your contact details on the completed questionnaire. Cllr Mrs Marion Warren stepped down from the Chairmanship of Wendron Parish Council at the meeting this evening. Cllr Mrs Sheila Moyle has been elected to the Chairmanship. Wendron Parish Council is seeking expressions of interest from residents of the Parish wishing to serve on the Council. For more information, please contact the Clerk. Wendron Parish Council is delighted to be able to inform its residents that a defibrillator is now in place and available for use by those in need at Wendron Cricket Club. Following on from the Housing Survey, which was undertaken in 2011 and which identified the need for Local Needs Affordable Housing within the Parish, Wendron Parish Council is delighted to be able to report that a suitable construction site in Rame has been identified and moreover that the Cornwall Community Land Trust has undertaken to build several homes on it.